FullCalendar Events and Scheduling – this is a screencast based on version 2.9.1 of fullCalendar. Shows how to use dialogs and a date range picker. 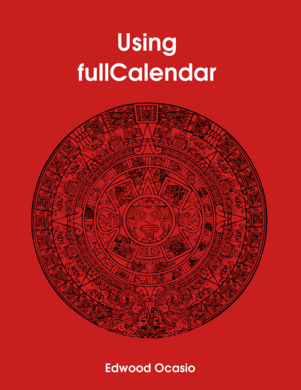 The book contains a Web2py application showing how you could integrate fullCalendar with the framework. flask-fullcalendar – Example of a simple integration with flask. I included a different example with the book. Laravel fullCalendar component – a component to integrate fullCalendar in Laravel projects. Vue fullCalendar component – sample code to integrate fullCalendar with the Vue.js framework. Fullcalendar Walk through with AngularJS – blog post showing a very simple integration with AngularJS. FullCallendar with React and ES6 – sample code showing how to load fullCalendar as a component in ReactJS. Most of these examples will give you the basics of integrating fullCalendar in your projects. After that very important step, you can use the examples in the book to customize its use.